NEW YORK, New York — Armenia Fund USA has taken critical steps to enhance and modernize health care and medical education in Armenia and Karabakh with the establishment of a new entity called HyeBridge Telehealth. The first step involved pioneering a pilot project in Telemedicine. 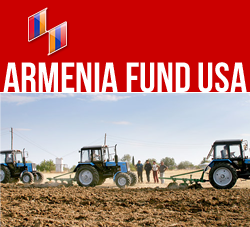 In 2008, Armenia Fund USA arranged for the satellite connection and equipment installation that would allow, via electronic telecommunications, the exchange of medical information between Armenia’s Yerevan State Medical University (YSMU) and health professionals practicing in remote regions of Armenia and Karabakh. The undeniable success of the pilot session convinced Armenia Fund USA that “telemedicine is an effective and cost-efficient driver of improved medical outcomes in Armenia”, as Irina Lazarian, Armenia Fund USA Executive Director, described it. Telemedicine includes such applications as videoconferencing, transmission of still images, remote monitoring of vital signs, continuing medical education and even nurse-advisory call centers. “For Armenia and Karabakh, this technology is next best thing to in-person consultations and on-premise clinical and classroom training,” noted Ms. Lazarian. To that end, Armenia Fund USA officially branded the telemedicine initiative “HyeBridge Telehealth”, an entity designed to function like a subsidiary of the Armenia Fund USA organization. Under the HyeBridge Telehealth banner, a demonstration was presented in July 2009 at the Tenth Annual Armenian Medical World Congress in New York City. Professional attendees gathered for a real-time telemedicine session transmitted from YSMU in Armenia. Four difficult patient cases were consulted with the use of the electronic technology. The response was so enthusiastic that the American-Armenian Health Professionals Organization (AAHPO) announced, at the Congress banquet, their decision to join HyeBridge Telehealth as a principal partner. Its involvement is consistent with the AAHPO mission: to improve healthcare awareness and increase disease prevention while providing medical support and education locally as well as in Armenia. The collaboration between the Armenia Fund, eastern affiliate and AAHPO doctors, dentists, nurses and pharmacists practicing in NY, NJ and CT, combines the world-class expertise of medical specialists in the U.S. with the vast field experience that Armenia Fund USA possesses in program implementation for Armenia and Karabakh. At the same time, YMSU manages scheduling of videoseminars and videoconsultation in Armenia and provides guidance and advice on telemedicine content design, based on the subject areas of greatest interest and most urgent need among professional counterparts in Armenia and Karabakh. Finally, this past October, HyeBridge Telehealth applied for and was granted membership in the American Telemedicine Association (ATA), which extends member rights to all HyeBridge Telehealth partners: Armenia Fund USA, AAHPO and YSMU. This affiliation promises to significantly expand global health care networking opportunities for HyeBridge Telehealth members as well as provide access to resources designed to advance Telemedicine in developing nations, such as Armenia and Karabakh. As a new member, HyeBridge Telehealth has been invited to participate at the ATA Annual Conference scheduled for May 2010 in San Antonio, TX. In addition, the head of ATA has agreed to participate, via videoconference, in selected telemedicine sessions that the YSMU has organized around its 90th Anniversary events and professional conferences from October 6-11 in Armenia. “By forging strategic partnerships between medical professionals in the diaspora and Armenia, supported by technologies that facilitate the instant exchange of up-to-date information, Armenia Fund USA has solidified its role in helping to bring Armenian medical practices up to world-class standards and providing quality care to all communities,” stated Raffi Festekjian, Chairman of Armenia Fund USA. Any individuals, professional groups or institutions interested in participating in HyeBridge Telehealth are invited to contact Irina Lazarian at 201-639-3985.